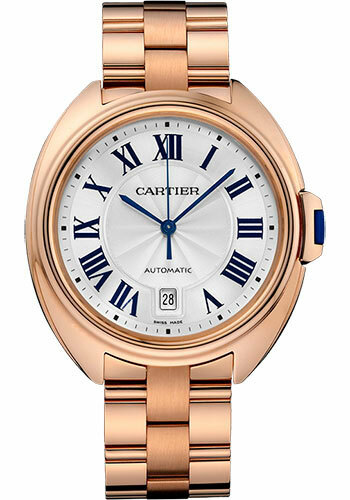 40mm 18K pink gold case, 11.76mm thick, sapphire back, 18K pink gold bezel, sapphire crystal, silver dial, caliber 1847 MC self-winding movement with blued-steel sword-shaped hands, 18K pink gold bracelet. Water resistant to 3 bar. 40mm 18K pink gold case, 11.76mm thick, sapphire back, 18K pink gold bezel, sapphire crystal, silver dial with flinqué sunray effect, caliber 1847 MC self-winding movement with blued-steel sword-shaped hands, brown alligator skin strap, folding buckle. Water resistant to 3 bar. 40mm 18K pink gold case, 11.76mm thick, sapphire back, 18K pink gold crown with a sapphire, sapphire crystal, silvered dial with Roman numerals and blued-steel sword-shaped hands, automatic movement, brown alligator skin strap, 18K pink gold double adjustable folding buckle. Water resistant to 30 meters. 40mm 18K pink gold case, 11.76mm thick, 18K pink gold crown with a sapphire, sapphire crystal, silvered dial with Roman numerals and blued-steel sword-shaped hands, calibre 1847 MC automatic movement, 18K pink gold bracelet, folding buckle. Water resistant to 30 meters. 40mm 18K pink gold case set with brilliant-cut diamonds, 11.76mm thick, sapphire back, 18K pink gold bezel set with brilliant-cut diamonds, silver dial, caliber 1847 MC self-winding movement with blued-steel sword-shaped hands, 18K pink gold bracelet. Water resistant to 3 bar. 40mm 18K pink gold case set with brilliant-cut diamonds, 11.76mm thick, sapphire back, 18K pink gold bezel set with brilliant-cut diamonds, silver dial, caliber 1847 MC self-winding movement with blued-steel sword-shaped hands, shiny bordeaux alligator skin strap, double adjustable folding buckle. Water resistant to 3 bar. 40mm 18K pink gold case set with brilliant-cut diamonds, 11.76mm thick, sapphire back, 18K pink gold crown set with a sapphire and brilliant cut diamonds, sapphire crystal, 18K pink gold dial set with brilliant cut diamonds and blued-steel sword-shaped hands, caliber 1847 MC self-winding movement, bourdeau alligator skin strap, 18 mm 18K pink gold double adjustable foldin buckle set with brilliant-cut diamonds. Water resistant to 30 meters.